Have you ever wondered if you’re automatically being avoided, strictly because of your Network Marketing tactics? What if you were, and you didn’t even know it? I was completely unconscious about it at first, so I’m telling you now, so you don’t have to go on struggling for years like I did! Let’s find out if you’re making these 5 deadly MLM mistakes! Below are 5 more (initial) extremely important tweaks you can do that will help you spring forward faster, and finally gain traction in your network marketing business before another quick year is over! Then when you hit the walls, (inevitable for most network marketers), you might just be kinda stuck there , excited, but not really getting anywhere, and it could literally be for years without the info below. So, finally, after the frustration was too much, I decided to be open and search for better strategies. We all hear about how “simple” it was to make the millions, but my own personal experience was the opposite of that, lol! They tell you things like, “just follow the simple system” and throw spaghetti against the wall with scripts, offline, online, or even at the grocery store! If you’re like I used to be, you may be trying to find smooth ways to bring the subject back up with your sharpest friends, or wondering why there’s crickets on your Facebook posts, right? LOL! Luckily I stuck in long enough to find my wits and the right mentors! FEWFF! Without some better strategies, you may just go deeper and deeper into debt with your vision of “catching the wave”. My internet mentor friends immediately let me know that the old school strategies were out of date, (but still being taught), and those who weren’t using the internet to leverage their network marketing were struggling. So here’s some initial crucial course correction! *As my mentors said: “Put down your ego, and pick up a pen”! I can crack jokes about this (because I used to do it too), but this guy just being way too nice, he had no posture, and he was being needy. You can just tell when there’s that weird anxious energy, where they want you in their business a little too much. The problem is, nobody will tell you the truth! He was trying to sell us on the compensation plan and “amazing products” and “it’s going to be a Billion dollar company” and all of the usual points. It doesn’t matter that your company is “the fastest growing” and “in momentum”. When you’re doing it wrong, it’s a nightmare, no matter which business you’re in. The comp plans are the same for everyone, in every business. The products are the same for every single person, in every single business. So why do some people make ridiculous amounts of income, and others hardly make anything? Only ONE thing left – YOU. The only thing that matters. People aren’t joining the product or the comp plan. They are joining YOU, so it is most important to gain the networking skills and education necessary to make it, so you are extremely valuable to people. If you’re like I used to be, you believe the products/service of our company are the greatest things in the world known to man and “everyone should want it”! BUT, the fact is, your prospect hates to be “sold”, and still thinks they are “too busy” and “not interested”… … … at first! Blurting out “I’m looking for someone who wants to make $$…. or join my team, private message me!” or posting a picture of some product does not work. Here’s why… People aren’t on Facebook to buy things, … (initially). People won’t see themselves working with your company, or using some product just yet. However, on a subconscious level, (which makes all of your decisions), if your prospect relates with “why” you’re doing it, (after you get honest and vulnerable, and tell a compelling story), then they’ll probably feel like you feel, and enroll themselves! Then it will be on their agenda to get what they want! Even if the internet was still in it’s early stages, it wouldn’t be a good idea to put your information out there so fast, because you immediately KILL their curiosity, and CURIOSITY is what keeps them COMING for more! Also, (instead of just being some distributor or promoter of some product/company), it’s always better to work at a higher level and brand yourself, for positioning and credibility. (More on that in this other post). If you put your company name out there…. Your potential prospect will immediately rush to Google and do their “research” on your company name instead of being curious enough to ask you for more information on what you do! They will immediately find the negativity out there, because the internet is “the bathroom stall of information“, and Facebook used wrong will be your biggest business prospects repellent! You want them to make an educated decision, so they don’t say “no” before they even know what they’re saying “no” to, don’t you? Ok, so they must see your personal value first, and be attracted to you! If they only see some crazy company name first, they’ll think they’re not interested, and they’ll run the opposite way because they’ll think you’re gonna try to “sell” them on it. A better thing you can do is have your Facebook business page or group in your profile (which provides tons of value, with great content) instead. This creates curiosity, rather than instantly repelling your Facebook prospects. If you satisfy their curiosity right off the bat, or even give them enough to they think they already “know what it is”, they will not have to “show up” to learn more, will they? This is why they are not showing up for you, or asking more about you! When you try to go too fast with people, (if you don’t care to build a relationship and probe for some powerful ways to provide real value for them), your business will go extremely slow, or not at all. People’s “sales filter” is on HIGH, so even the words “if you’re interested” make them run the other way! There must be way more thought and skill involved today if you’re going to be using social media. On the other hand, if you come with mega value first, (and no strings attached), and you take the time to care – to be interested in people, and go slow, (by building a real relationship first and finding out what results they would want in their lives) – then your business will actually go fast because you build trust and credibility – and people only buy from people they trust. Yep, they only join people who they think will be valuable to them, and the more value you put out there, the more credit you will build. This takes TIME! As you can see, people who have a lot of credibility with their network tend to do very well in this type of business. All day every day, you can see people trying to be interesting on Facebook, yeah? So how do you differentiate? You can be interested, always be curious… probing to know more about others! And how can you even help someone if you don’t know what they want? Helping them on a deeper level takes more TIME. So, when you post, ask questions, like “what do think about this?”. You can create more engagement, and show you care about their opinion! If you don’t get to know them, then you will only know what YOU want, and trust me, they don’t care what you want! They only care about what THEY want! So find out what they want! It’s not called Network “spend hours and hours chasing everyone down, trying to convince them into your business, one by one” or Network “private messaging all your cold contacts one by one on Facebook”! It’s also not called Network “invade everyone’s space on Facebook with your flashy products until they buy something” Marketing! lol! I can joke like this, because I did all of that too! haha! “Do house parties. Prospect everyone! (Even though this business is not for most people). Write down 50 contacts. Use the scripts. Call every one of them! Drive all over town to meet them. Show up to every meeting! Make business cards and a Facebook fan page and fliers and wear your T-shirts with your company name on ’em so you can spam everyone online, on the street, and on the coffee shop wall! Throw that spaghetti on the wall, and don’t worry about all that rejection, those people are just negative dream-crushers! Should I go on? I think you get the point, LOL!! They told me the same old school stuff. Nothing wrong with it, but for me, it wasn’t the most efficient and we just didn’t have the time for everything. If you’re like I was, you’re frustrated and anxiously looking for a way to work smarter, at a higher level, so you can attract high-caliber leaders and build a real business. But I’ll also tell you this: Done RIGHT, it’s a DREAM! Now, imagine knowing how to get your information in front of perfectly aligned buyers who are already interested in your products on the social media platforms. You literally wake up to messages (from qualified buyers and hungry entrepreneurs), coming to YOU, asking for appointments to learn more about you and your business. You can laser target those who are already interested. To get a free network marketing training series, GO HERE. Yes, it takes time to learn, but it’s SO WORTH IT! Heck, what about just being able to relax at dinner with your family instead of feeling anxious trying to think of smooth ways to bring up your network marketing business to your waitress? LOL! 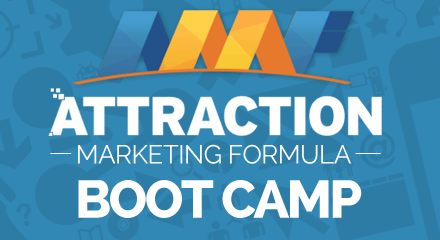 If you wanna learn more on how to avoid the time-wasting energy suckers and attracting the RIGHT buyers, you can read The Attraction Marketing Formula e-book and get a free training series HERE. It was an absolute paradigm shift and changed our business forever, but most importantly, you’re gonna have way more FUN! Ok, I hope these initial 5 (major) tweaks were helpful like they’ve been for us over the years! We have WAY more, so give us a “LIKE” to stay plugged in, or leave us a comment, and share if it helped!